For centuries, the sea has enabled trade between nations. 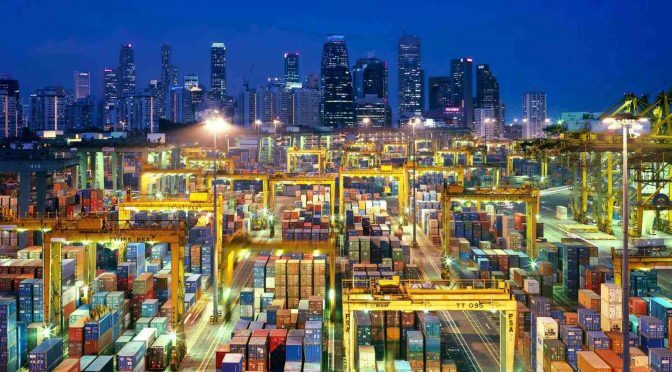 Shipping continues to underpin international commerce today. But there is another unseen contribution that the oceans make to the current global order. Deep below the waters, travelling at millions of miles per hour, flickers of light relay incredible quantities of information across the world, powering the exchange of data that forms the internet. From urgent stock market transactions to endless videos of cats, undersea cables support many aspects of twenty first century life that we take for granted. A moment’s thought is sufficient to appreciate the strategic importance of this fact. As a result, any discussion of future seabed warfare would be incomplete without a consideration of the challenges presented by ensuring the security of this vital infrastructure. Strategists have neglected submarine cables. Whilst topics such as piracy and cyber attacks on ports frequently arise in discussions on maritime threats, cables have not always been as prominent. Some authors have identified the potential risks (such as this 2009 report for the UN Environment World Conservation Monitoring Centre), but these works have not always received the attention they deserve. This is a present threat, not just a hypothetical one. In late 2017, the NATO Submarine Commander Rear Admiral Lennon of the United States Navy revealed “We are now seeing Russian underwater activity in the vicinity of undersea cables that I don’t believe we have ever seen. Russia is clearly taking an interest in NATO and NATO nations’ undersea infrastructure.” The challenge is to maintain this focus and turn a passing spotlight into seriously considered policy. Vast technical expertise is not necessary to understand why submarine cables are so important. A basic awareness of their construction and use is sufficient. The internet is, at its most basic level, a transfer of information. With the advent of cloud computing, the simple act of storing a file means that data travels from a user on one continent to a server halfway around the world. Although popular imagination sees this happening by satellite relay, in over ninety five percent of cases the physical means for moving this information is a series of light pulses, travelling along a fiber optic cable laid over land and under the sea. These cables are thin silica tubes embedded in a protective cladding, approximately the size of a garden hosepipe. The capacity of these cables to transmit data is ever-increasing. Recent experimental cables have been reported as being capable of transmitting up to one petabyte of data per second. To add some perspective, a petabyte of storage would allow you to store enough music that you could play it continuously for two thousand years. Submarine cables are mainly private assets. Although expensive (an intercontinental cable is cited as costing between $100 million to $500 million), they are significantly cheaper than the satellite alternatives. In addition to the ownership by telecommunications companies, internet companies, including Facebook and Google, now heavily invest in submarine cables. These cables are laid by specialized ships, capable of carrying up to 2000km of cable, which can be laid at a rate of up to 200km per day. In offshore areas, the cable is laid directly onto the seabed. On the continental shelf, a plough is used to bury the cables and provide some protection from accidental damage, usually caused by anchors. These cables are vulnerable to deliberate attack in many ways. The most basic method of attack is simply to break the cable. Their construction means that this task presents little difficulty either mechanically or through the use of small explosive charges. Finding these cables is equally simple. The location of the cables is widely promulgated in order to prevent accidental damage but there is little to stop adversaries from exploiting this information for nefarious ends. Whilst there are a network of repair ships around the world, it is obvious that any service denial cannot be instantly fixed. Multiple attacks, particularly on alternative cable routes, would quickly exacerbate problems and could be organized relatively easily. As the Policy Exchange report highlighted, there is no need to actually proceed to sea to attack the cable network. The landing stations, locations where the submarine cables come ashore, are both well-known and lightly protected. This is a potent combination, particularly when cables are located in fragile states and presents additional challenges when assessing the security of the network. Cables can also be attacked in non-physical ways. Although shrouded in classification, intelligence analysts have openly stated in national newspapers that the U.S. submarine, USS Jimmy Carter, may have the capability to “tap” undersea cables and obtain the data being transferred without breaching the cable. There are concerns that the Russian Yantar vessels share similar capabilities and these are explored in depth in a recent post by Garrett Hinck. Military planners must understand that defending the submarine cable network might not mean simply preventing physical attack but also ensuring the integrity of the data being transmitted. Legally, the status of undersea cables have little protection, particularly when they are outside the jurisdiction of any state and lie on the seabed of the high seas. This is certainly the conclusion of the two major legal studies that have addressed the problem. 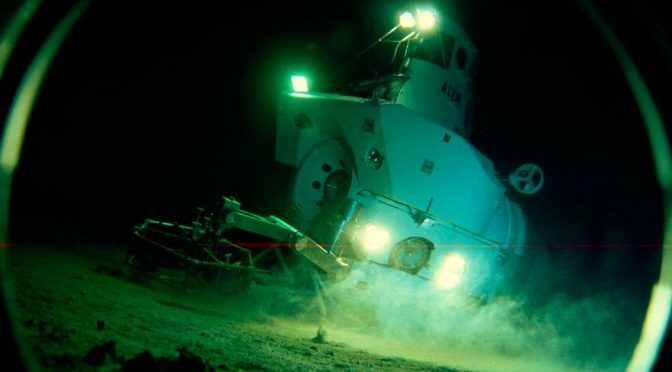 Professor Heintschel von Heinegg considered submarine cyber infrastructure in a chapter of a NATO Cooperative Cyber Defence Centre of Excellence publication in 2013 and concluded that “the current legal regime has gaps and loopholes and that it no longer adequately protects submarine cables.” Similarly in 2015, Tara Davenport of Yale Law School examined the same topic and stated “the present legal regime is deficient in ensuring the security of cables.” The peacetime protection of submarine cables is a grey area in the law and this provides an additional challenge when assessing how cables should be protected. The legal status of submarine cables in times of war is equally unclear as observed recently in a post for the Cambridge International Law Journal and another post on Lawfare. There is no authoritative work examining the status of submarine cables in armed conflicts, but even a brief overview is sufficient to highlight the problem. The first question is whether an attack on a submarine cable (outside of a state’s jurisdiction) qualifies as an “armed attack” for the purposes of article 51 of the UN Charter, permitting the use of force by a state in self-defense. The Tallinn Manual on the Law Applicable to Cyber Operations takes the position that the effects of a cyber operation must be analogous to those resulting from a “standard” kinetic armed attack. Simultaneously, it acknowledges that the law is unclear as to when a cyber operation qualifies as an armed attack. Would the consequences of a submarine cable breach be sufficiently serious to raise it to the level of an armed attack? It is difficult to provide a definitive answer but if the answer is ‘no’, then states would not be entitled to use military force to defend submarine cables in the absence of an existing armed conflict. With regard to illicit surveillance of cables, the Tallinn Manual clearly concludes that intelligence gathering from submarine cables would not amount to an armed attack. The ability of States to target submarine cables during times of war is also open to discussion. Objects may be targeted under international humanitarian law if they make an effective contribution to military action due to their nature, location, purpose, or use and if their total or partial destruction, capture or neutralization offers a definite military advantage. The best example of the extent of military reliance on civilian owned and operated undersea cables is contained in a 2010 Belfer Center paper. This records that three of the largest cables between Italy and Egypt were severed in late 2008. As a result, U.S. UAV operations in Iraq were significantly reduced. Submarine cables simultaneously transmit critical military and civilian data. Whilst the presence of the former means that they may be targeted, this is always subject to the principles of proportionality and precautions in attack, designed to minimize the harm to the civilian population. Due to the range of data carried by cables and the number of services that are likely to be affected, these assessments may be very difficult to carry out. An understanding of when cables can be targeted is likely to be highly fact sensitive and it is entirely possible that states will take different views on when this is permissible. Clearly, a protection strategy for undersea cables cannot depend solely on military action. It is impossible to protect the entire cable network given its global expanse. The geographic area requiring protection is simply too large, even for the most powerful of navies. The natural consequence of this conclusion is to focus on identifying and intercepting ships and submarines capable of interfering with the cable network. However, the practicalities of this option are not promising. The technology required to tamper with cables is not overly sophisticated. It can be hosted in a wide range of vessels and easily transferred between them. Submarines present additional challenges in monitoring, tracking and interception, requiring the use of satellites, intelligence, and underwater sensors. For a military commander, the task of protecting seabed submarine cables from attack can seem almost impossible. Given this conclusion, national strategies may need to focus on alternative methods of safeguarding the exchange of information. One method would be to increase the level of redundancy within the system by laying additional cables. As cables are expensive and most cables are privately owned, additional routes have to be assured of sufficient funding to make them viable. Somewhat ominously, the International Cable Protection Committee (which represents cable owners) states that “most cable owners feel that there is enough diversity in the international submarine cable network.” This might be true if the only threat is from accidental damage. However, this analysis might change with the realistic prospect of deliberate targeting. The ideal solution would be the existence of a globally accepted international treaty giving protection to submarine cables by prohibiting interference and clarifying the status and protections of cables. It is a solution advocated by a number of the sources previously cited. Given the shared interests of many, if not all states, in securing the submarine cable network, this may not be unattainable. Regulation of these cables outside the territories of states would not involve any restriction on national territorial sovereignty, increasing the chance of multilateral agreement. Unfortunately this opportunity has not been seized by a distracted international community. 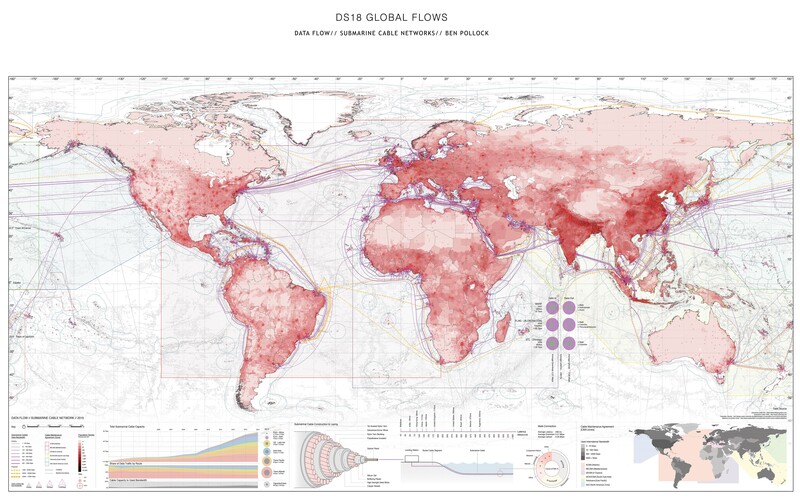 Arguably the most important strategic asset on the seabed is the submarine cable network. They present a unique vulnerability that is challenging to protect and subject to an uncertain legal regime. Any analysis of seabed warfare must concern itself with cable protection. The best way to achieve this is the adoption and acceptance of a treaty regime that acknowledges their importance to the modern world. Until this is achieved, military commanders must factor the exceptional challenges of defending these cables into their plans for seabed warfare. Earlier this month the Federation of American Scientists held its annual Symposium on Catastrophic Threats and Awards Ceremony at the National Press Club in Washington, D.C. The date – November 9th – was chosen to coincide with the November U.S. presidential election and provide a forum for policy recommendations to a newly elected administration. The symposium provided a wonderful venue for the discussion of the most-pressing threats facing the U.S. Panelists called for steps to prevent catastrophic events, and increase response planning and preparation to those possible dangers. 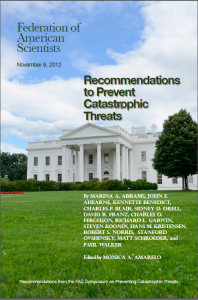 These recommendations were published in a booklet, available electronically. Because science plays such a critical role in underlying U.S. policies, from disaster preparation to farm subsidies, leaders must be armed with a science-based knowledge of the risks and opportunities policy choices present. To this end, the symposium featured moderated discussions of four-to-five distinguished experts, grouped into related threat-areas: Nuclear Weapons; Biological, Chemical, Conventional, and Cyber Threats; and Energy and Infrastructure. The session devoted to nuclear threats reiterated the group’s long-held goals of stockpile reduction and eventual total disarmament. Senior FAS Fellow Charles Blair emphasized that the U.S. must start differentiating violent non-state actors in terms of their ability to pose a bona fide radiological or nuclear (R/N) threat, rather than treating all threats as possessing equal capabilities. Proper identification of the threat will allow targeted policies and avoid wasteful expenditures of time and resources on groups that do not pose significant R/N threats. Another FAS Fellow, Dr. Robert Norris, proposed that a fundamental alteration of Cold-War era nuclear doctrine is a prerequisite for arms reduction, with a minimal deterrence mission the only necessary use for the U.S. nuclear arsenal. Lengthy discussions of biological-, chemical-, and conventional-weapons threats highlighted the need for increased accountability and controls, which are scarcer outside the United States. Perhaps the most significant threat in the chemical and biological weapons fields stems from the fact that there is a growing dearth of technical experts in the former Soviet Union to handle existing stockpiles of agents. Without the incentives of prestige and financial rewards available during the years of the thriving Soviet weapons programs, even fewer personnel with the requisite training will be available to handle and safeguard stockpiles in the future. 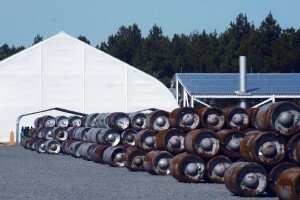 Those barrels full of chemicals looks safe to me! The energy and infrastructure panel spoke in favor of nuclear energy with reminders that natural gas does not eliminate greenhouse gas production. They also reminded attendees that the U.S. will likely import oil from Canada long after it frees itself of overseas imports. Dr. Steven Koonin, of NYU, called for increased funding for alternative energy research and a reorganization of the Department of Energy to enable better understanding of markets and business policies. Notably absent from the discussion was an in-depth assessment of the impact that the Fukushima Daiichi incident will generally have on nuclear power endeavors in the future, and in Japan specifically. One subject that stood out for immediate attention is developing a framework for rules and definitions in cyber security and warfare. The United States is ill-prepared to respond to a major denial of service attack aimed at critical infrastructure, especially in the cyber realm. Dr. Kennette Benedict, from the Bulletin of Atomic Scientists, explained that the field lacks clarity on responsibilities and acceptable scope for security. Increasingly sophisticated attacks on private and public networks demand a robust effort to ensure reliability and freedom from interference. While the private sector has tremendous incentives to shore up defenses against intrusion and would benefit from federal support in defending network architecture, transparency and trust are in short supply at this time. 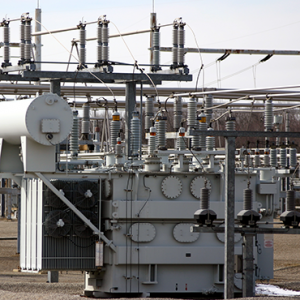 As an illustration, were a major electrical grid or other critical infrastructure component attacked, resulting in losses of life and industrial output, how would the United States respond? Would this be defined an act of terror an act of war? Would the response be treated like a natural disaster? No clearly defined roles have been established for preventing and/or prosecuting major acts of cybercrime. No public forum exists to discuss the norms associated with cyber warfare, define acceptable measures that may be taken against individual or state-sponsored actors, or set limits to intrusion that occurs under the guise of security. We can’t be hacked if we unplug it from the grid, right? Not only will clarifying these issues benefit the private sector, but transparency will also pay major dividends in foreign policy negotiations. As with any new weapon, uncertainty will lead to mistrust and fear, which often precipitate wasteful arms races. U.S. leaders must come to the table with candor in order to develop policies that promote security with minimal interference for all. A massive blackout or disruption of services would be devastating for everyone; CIMSEC could be the group that suggests a way forward. LT Drew Hamblen is a naval aviator in the U.S. Navy and graduate of Georgetown University. The opinions and views expressed in this post are his alone and are presented in his personal capacity. They do not necessarily represent the views of U.S. Department of Defense or the U.S. Navy.